1. The Department of Conservation and Recreation manages a concrete ramp and adjacent parking area suitable for 18 trailers off of Lakeside Avenue on the southeastern shore. 2. The Town of Webster manages a double concrete ramp and large parking area at Memorial Beach off of Route 193 on the northwest shore where a parking fee is charged. Shoreline access is limited to areas adjacent to the ramps. Please contact the City of Webster or the offices of the Douglas State Forest for additional information and/or restrictions pertaining to public access of Webster Lake. 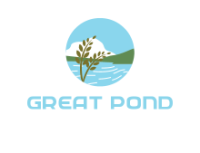 species: Largemouth Bass, Smallmouth Bass, Chain Pickerel, Yellow Perch, White Perch, Black Crappie, Bluegill, Pumpkinseed, Redbreast Sunfish, Brown Bullhead, Yellow Bullhead, White Sucker, and landlocked Alewife. Trout are also stocked annually in the spring and fall. At the end of the ramp head east on Main Street (Route 16 East). At mile 1.7, bear right onto Gore Road. At mile 1.9, bear slight right onto South Gore Road. At mile 3.2, turn right onto Lakeside Avenue. Webster Lake offers an extremely diverse fishery with Largemouth Bass, Smallmouth Bass, Chain Pickerel, trout, and an assortment of panfish. Trout fishing is very popular in the spring which gives way to bass and pan fish fishing in the summer. Webster Lake also has an exceptional Black Crappie population with individuals in the 1 to 2 lb range commonly reported. Webster Lake has produced Largemouth Bass, Smallmouth Bass, Chain Pickerel, bullhead, Black Crappie, Yellow Perch, White Perch, Sunfish, Rainbow Trout, Brook Trout, and Tiger Trout that meet minimum sizes for recognition by the Sportfishing Awards Program. The Nipmuc Indians were the first people to inhabit the area around Webster lake. They were hunters and gatherers of the local berries, herbs and mushrooms. They also planted the meadows with small hills of corn, beans, and squash. A fish from the lake was buried in each hill during planting for fertilizer. 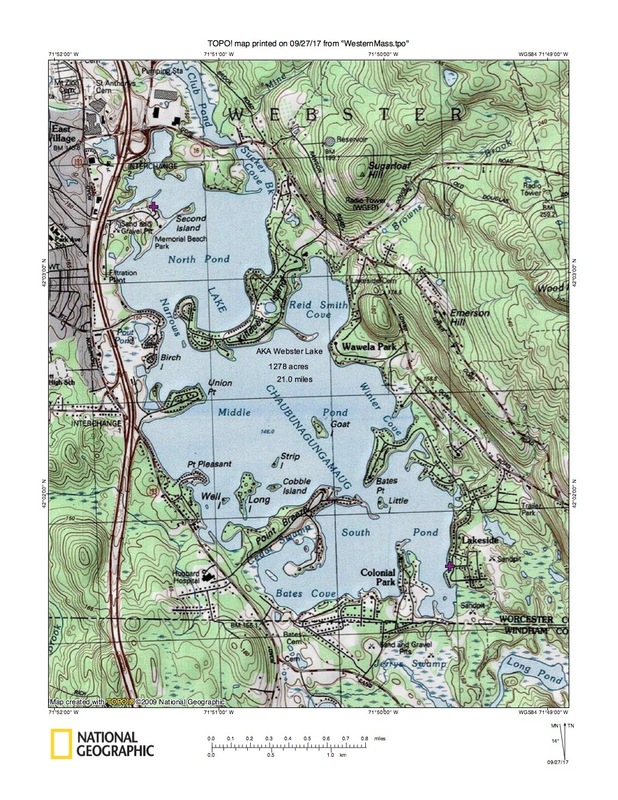 Webster Lake is a 1,278 acre great pond located just east of route 52, abutting the Connecticut border in Webster and is the state’s largest natural lake. 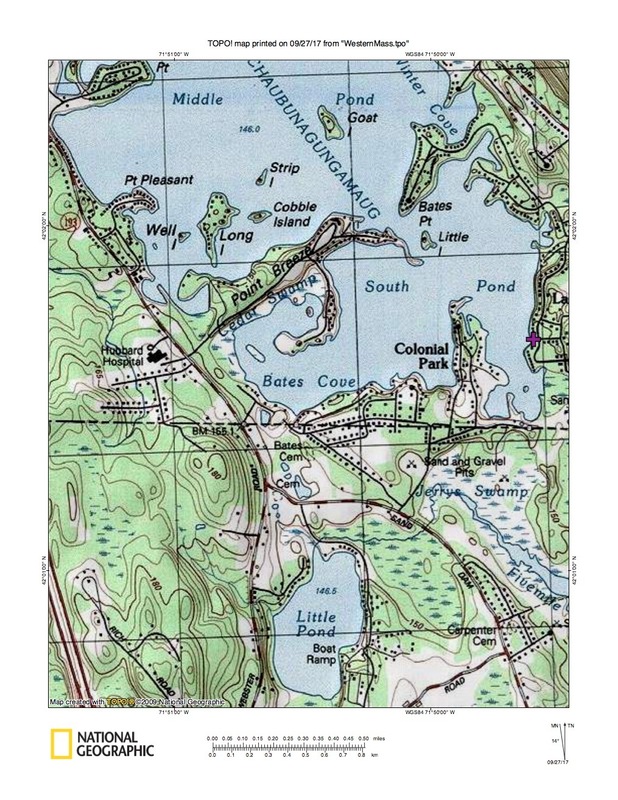 When the lake was shallower, many years ago, horse drawn wagons crossed Middle Pond, going from the western shore across Long Island, then Strip Island, then Goat Island, then to the eastern Shore. The dam was originally constructed to provide water for Slater Mills, which was located at the site of the current shopping plaza at East Village Square. This raised the lake about 2 feet from its natural state. Later, the water rights to the lake were owned by Cranston Print Works. The dam is now owned by Webster Lake Preservation LLC. 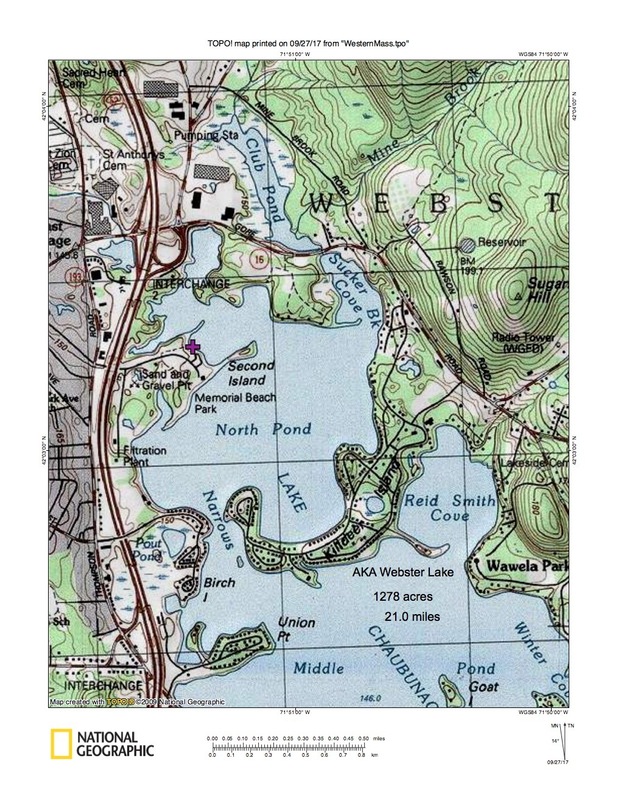 The underwater terrain of Webster lake is quite complex, particularly in the central basin which contains deep holes, submerged plateaus, and rocky shoals all in close proximity to one another. The bottom is primarily mud and rock with areas of aquatic vegetation which are largely restricted to shallow coves. The shoreline is heavily developed and the lake receives heavy recreational use during summer. WLA members have participated in a wide variety of activities intended for the benefit of the lake. Weed treatment, lake management, fund-raising, public service, information programs and social events have all been part of the Webster Lake Association activities.